December 4th and the cold front hit northern California. So what is the best drink for keeping warm? Normally I'm not a big hot chocolate person, I would rater have a good latte. But the peppermint lightens up the hot chocolate and makes it scrumptious . My husband loves ice cream, so we made this treat as a compromise. I really hope you will enjoy it. In December you see peppermint everywhere, and I learned that peppermint is the holiday flavor of choice for americans. And why not adapt the seasonal flavor in a decadent dessert? I love a normal affogato, an espresso poured over a scoop of vanilla ice cream. It's a perfect ending to a great Italian dinner. So combining the affogato and the peppermint hot chocolate, I see in every coffee shop this time of year, must be a perfect match. Here I flavored a classic ice cream with peppermint and topped it off with a decadent hot chocolate. In another bowl, whisk the egg yolks. Slowly pour the warm milk into the egg yolks, while whisking constantly, then scrape the warmed egg yolks back into the saucepan, and heat the mixture over medium heat, until it thickens. Stir constantly in this process and make sure to scrape the bottom of the saucepan. Add the peppermint extract, ½ teaspoon at a time, taste the custard. Pour the custard into a ice cream maker and freeze it according to manufacturers instructions. Sprinkle with crushed candy cane just before you scoop out the ice cream. The making of the custard is a basic step in the ice cream making. You can flavor your ice cream to your liking after the custard is made. It's also possible to add flavor to the milk while heating. Heat whole milk and chocolate in a saucepan, whisk while heating. 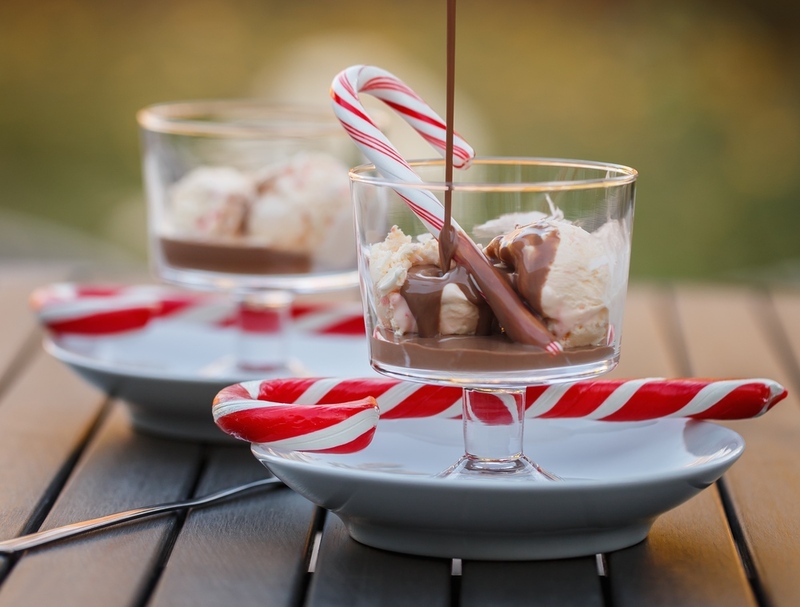 Serve the ice cream in a glass, pour the hot chocolate over and sprinkle with crushed candy cane.